khoi's portfolio [w/commentary]: Scoop DeVille - "It's That Important"
Here is a logo design and 2 ads I created for my Art Direction I class in Spring '09. We worked in collaboration with an Account Planning class in the advertising department. The other class presented their creative briefs to us and in turn we had to create ads that best reflected the content of the strategy. Our client was Scoop DeVille a local Ice-cream scoop shop in Philadelphia. We were targeting 18-24 year olds, specifically females, who enjoy eating ice-cream but are not entirely loyal to a single brand. The account planners wanted us to really emphasize Scoop DeVille as more than just a place to get ice cream, but as a place to cherish memories and create new ones with friends, family and loved ones. They wanted the advertising to have an extremely friendly, almost loving tone that reflects the atmosphere and look for Scoop DeVille. 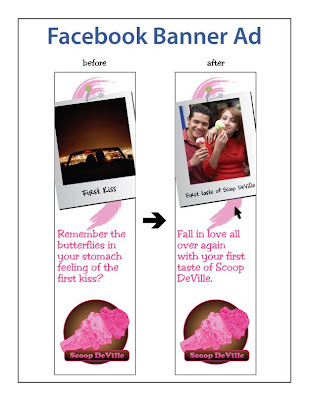 Before I started the ad, I wanted to first create a distinct logo for Scoop DeVille. It's a fun logo, consistent with Scoop DeVille colors as well as the fun feel of the ad. After researching the brand a bit, and visiting the scoop shop, I decided on the idea for my print ad. It revolves around the idea of a young girls scrapbook with her most cherished memories, more specifically her most important "firsts," such as first kiss or first anniversary. And then I finish it with "first taste of scoop deville." And the headline, "It's That Important," I thought really hammered home the idea of Scoop DeVille as more than just an ice-cream shop, but a place where people can cherish memories and create new experiences with loved ones. The white ad was the one I used to present to the Account Planning class, but I included the black ad in this post because I like the way it looks in web. I also created the logo in all of the ads. As a part of the assignment we were to create complimentary ads that showed how our current ideas could be used in a campaign. I decided to make Facebook banner ads, because I thought Facebook would be the perfect medium to reach segmented users, specifically the 18-24 females.